When you bring a puppy home, you start with a blank slate. That means you have the awesome responsibility to form your cute ball of fluff into a well-mannered dog. 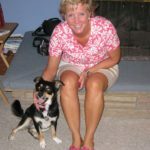 Use DogsBestLife.com’s Puppy 101 guide, to help get your puppy started on the right paw. Puppies need lots of sleep and have short attention spans. Avoid overwhelming them and be sure to break up training time with plenty of snuggles, treats and naps. The first thing you need to know or remember is puppies — and dogs — are a lot of work. 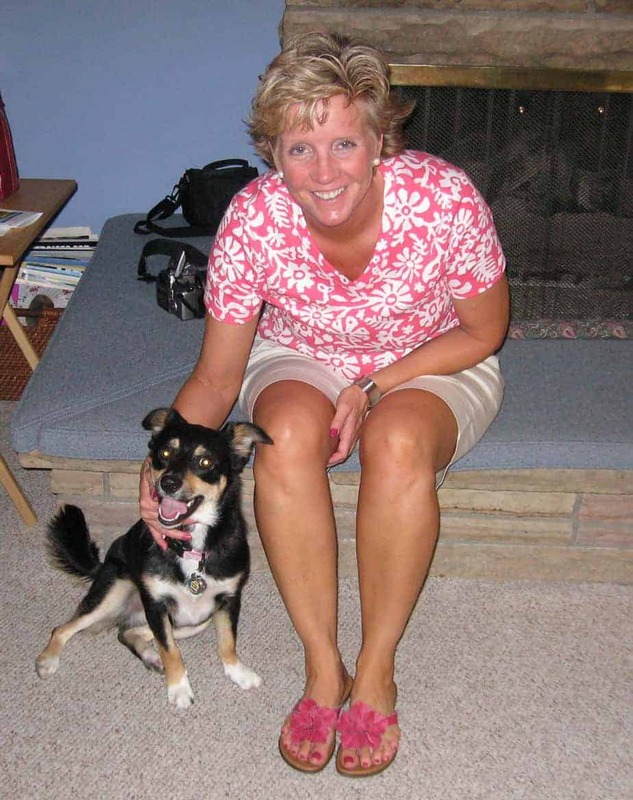 Kathy Thorpe, owner of Paw School in Denver, recommends new dog owners do research before choosing a dog. Tiana Nelson, president of PawsCo, says it’s important for people to fully understand that getting a pet is a major commitment. PawsCo is a Denver-based nonprofit dedicated to reducing pet overpopulation. “Bringing an animal into your life is a big step, and it requires transition time for both the human and the animal,” Nelson says. It’s easy to be overwhelmed when you start out with a puppy or a new dog. Don’t get stressed out — this should be a fun time for you and the dog. That’s why we’ve created Puppy 101 — a guide designed to help you create a plan that will work best for you and your dog. Thorpe recommends new dog owners take plenty of time to bond with their dogs before they start anything else. Relax and take some time to bond with your puppy. It’s fun and it’ll help you build a foundation of trust that will make it easier to train your dog. As part of the bonding process, I recommend spending lots of time petting and holding your puppy. That’s basic puppy 101. Browning loved to be held like a baby. He’d rest his head and front paws on my shoulder and stretch his (then) little body along my chest and prop his back paws against my waist. Sydney has always liked curling up in my lap while resting her head on my arm. She seems to like the added security of having my arms around her — even at age 8, she likes to be held and cuddled. 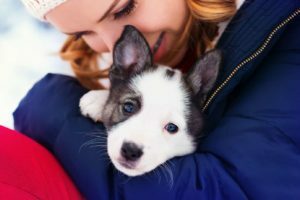 Dogs — especially ones that are coming from a breeder or even ones that have been adopted from a shelter where they’ve been kenneled with litter mates or other puppies, are used to lots of body contact. They love to snuggle and it is any easy way to let them know you are someone they can trust. After you bond with your puppy, start working to socialize her. Thorpe urges dog owners to focus on socialization first and then worry about obedience training. Nelson recommends new pet owners think about socialization using a stair-step approach. For the first 16 weeks, puppies are creating or developing their personalities, Thorpe says. That’s why it is critical to expose them to lots of people, different kinds of experiences, other dogs and car rides. Puppy 101 tip: Take them with you when you run errands, invite friends who have vaccinated, well-behaved dogs over to your home. Socializing puppies helps build a foundation that will allow them to be successful for the rest of their lives, Nelson says. One great option is to look for a puppy kindergarten or puppy socialization class, Nelson says. The classes offer a chance for the puppy to meet new dogs and new people — all with the oversight of a trainer. “It’s a great first step,” she says. At Paw School, the puppy socialization classes are a mix of play with interruptions to work on skills such as walking on leash and learning to focus on their owners, Thorpe says. 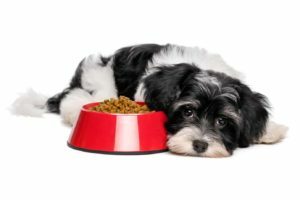 One of the first things most new dog owners want is to quickly and effectively potty train their dogs. That’s basic puppy 101 training. And the key to that is to set a strict schedule of feeding and getting the puppy outside for a potty break. Thorpe recommends getting the puppy outside every two hours in the beginning and then working to extend the time between potty breaks. “Unless they have some sort of infection, most dogs will be house trained by the time they are 5 to 6 months old,” she says. Because your dog wants to please you, Nelson suggests associating potty breaks outside with positive things — such as praise and treats — from the first day. 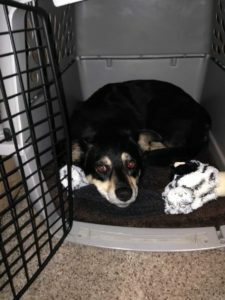 If taught properly, a crate can provide a safe and puppy-proofed area for your dog to sleep in while you are away, or not able to keep that constant eye on him. Thorpe says most dog trainers consider crate training a positive because it gives the dog a safe, secure place to be. The key is not keep the dog in the crate for too long and to never use it for punishment. I’m a big believer in the power of crate training. I’ve used it with my three dogs and it works. How long the dog needs the crate will depend on you, your schedule and your dog. Browning, my beagle-labrador mix, slept in his crate until he was about 10 months old. Then, like a baby who outgrows a crib, he didn’t want to sleep there any more and was quite vocal about it. I got Finley, a beagle-cocker spaniel mix when he was 4 months old and he never really got attached to his crate. But Sydney, my Australian shepherd-corgi mix, is now 9 and still loves her crate. She sleeps in it every night and it’s her safe space. I often find her curled up there taking a nap. Thorpe encourages owners to wait until their puppies are 12-15 weeks old before starting formal obedience training. She also suggests they attend four or more puppy socialization classes and start working with their puppies at home before attending obedience classes. The lessons at home can be as simple as helping your puppy learn to control her bite. 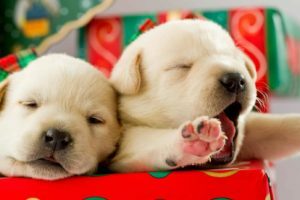 Puppy teeth can be razor sharp and as they start teething puppies want — and need — to use their mouths more because they hurt. It’s important for your puppy to understand they can never bite or gnaw on you, Thorpe says. When puppies play with their litter mates, if they bite too hard, they get a yelp in return. New dog owners always need to remember that puppies have short attention spans and do best when you keep training sessions short and mix obedience training with playtime. Training can begin as soon as you bring your new pet home, Nelson says, and there are opportunities for training everywhere. Another valuable early training step is getting your puppy used to walking on a leash. In the beginning, you won’t be able to go too far because puppies don’t much stamina. When I first got Sydney, a walk around the block would exhaust her. It’s also important to not let your cute little puppy pull you around. “Puppies want to explore and although it’s cute when your puppy pulls on the leash, someday your 10-pound puppy will be 75 pounds and they will want to repeat that behavior,” Thorpe warns. For bigger dogs — or especially obstinate leash pullers — consider using a training tool like the Trip Less Trainer, a shorter leash that the human holds using a thumb tab. The shortened leash prevents either the dog or the owner from tripping or getting tangled and allows the owner to quickly correct behavior issues. And there’s no ideal time when you have to start dog training. Dogs love to learn and it’s never too late to start training. Part of being a good dog owner involves making sure your dog gets proper health care. If you don’t know a veterinarian, ask friends or family members for recommendations. Puppies need a lot of care — including a series of vaccinations — and you’ll need to make decisions about whether and when to spay or neuter. Don’t be shy about asking your vet questions or doing your own research. I also recommend getting pet health insurance to help cover some of your major expenses. Dog owners can buy policies for both general health coverage (which helps with costs like vet visits, vaccines and spaying or neutering) and catastrophic care in case of emergencies. Be sure to touch your dog a lot when she’s little. Stroke her ears and hold her tail and paws. Brush her coat and teeth. 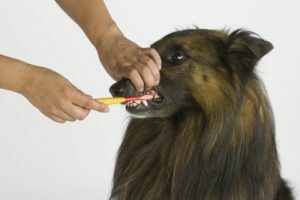 Desensitize your dog to having their mouths examined and teeth brushed by starting when they are young. “Helping your new pet become comfortable with handling will help when it comes to a lifetime of brushing their teeth, having their nails clipped, and going to the vet,” Nelson says. She suggests touching your puppy’s ears, mouth, tail, and paws daily. “Always do so with a gentle demeanor since pets can read our emotions well,” Nelson says. 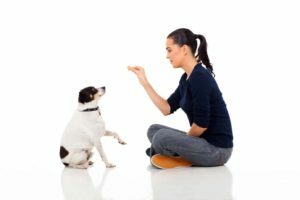 She also suggests giving your dog treats and always speak in a calm tone so your dog has a positive association with handling. When I got Sydney, I wanted to make sure I did a good job brushing her teeth each day. She has never enjoyed having her teeth brushed, but she loves having her coat brushed. So, I decided to make it all a process. I get her hair brush out when I get her toothbrush and paste out. After making sure she sees the hair brush, I brush her teeth. When I’m finished, I brush her coat. Giving her a treat after brushing her teeth defeats the purpose, but brushing her coat gives her a reward she enjoys and provides some basic grooming. 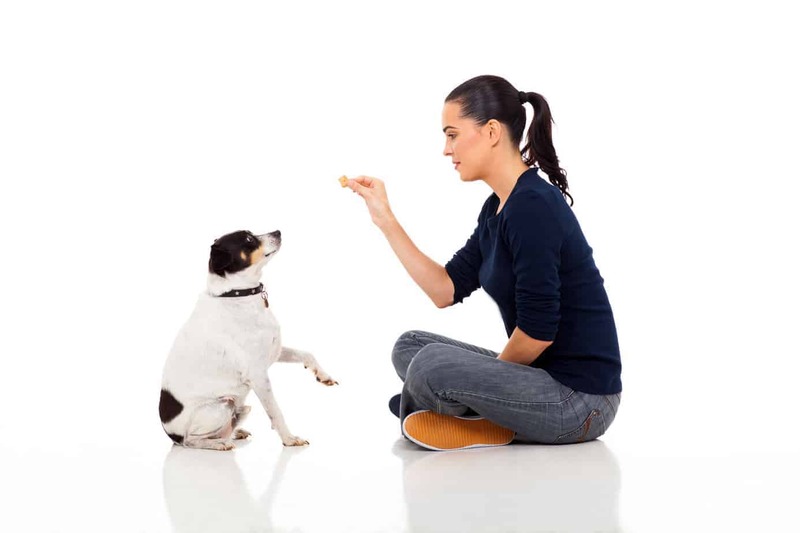 Feeding your dog at regular times helps establish a routine and makes it easier to potty train. Providing structure and lots of positive reinforcement for a new pet is important – they need to learn how your world works and what expectations you have for them, Nelson says. Creating a routine — regular times for food, walks, sleep — makes your dog feel more secure and helps with potty training and can help prevent bad behavior. 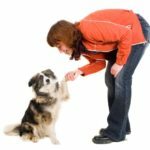 It’s also helpful to learn some canine body language so you can determine how the new pet communicates with you, and how you can best communicate with your new pet, Nelson says. Thorpe warns dog owners that training is a lifelong process and that some dogs can be more difficult to train than others. Bottom line: Use our Puppy 101 guide to create a plan that works for you. For successful puppy training, it’s all about building a routine. Dogs love routine. They like to know what you expect from them and they love to please you. Help your puppy learn how to do that and you’ll have a long, happy, productive relationship. This is a massive guide! What I loved the most is the fact you pointed out about postponing the training and focusing on puppies development through socializing with you and other dogs. This is probably most important and will determine if your dog is going to be easily trained later or not. But nevermind the training for a second and let’s just think how sad it would be to miss these first weeks of your dog’s life by not being there for him/her and not developing that strong bond. Hope people find it helpful!